The problem with this blog is that I am constantly finding out how much I do not know. When I am researching the background for a new post, I find a new subject which takes me off on a tangent – an example being the subject of today’s post, the War Artists Advisory Committee. Before getting into the detail of the post, I must apologise for the length, the more I looked, the more I found – I hope you will find it interesting. 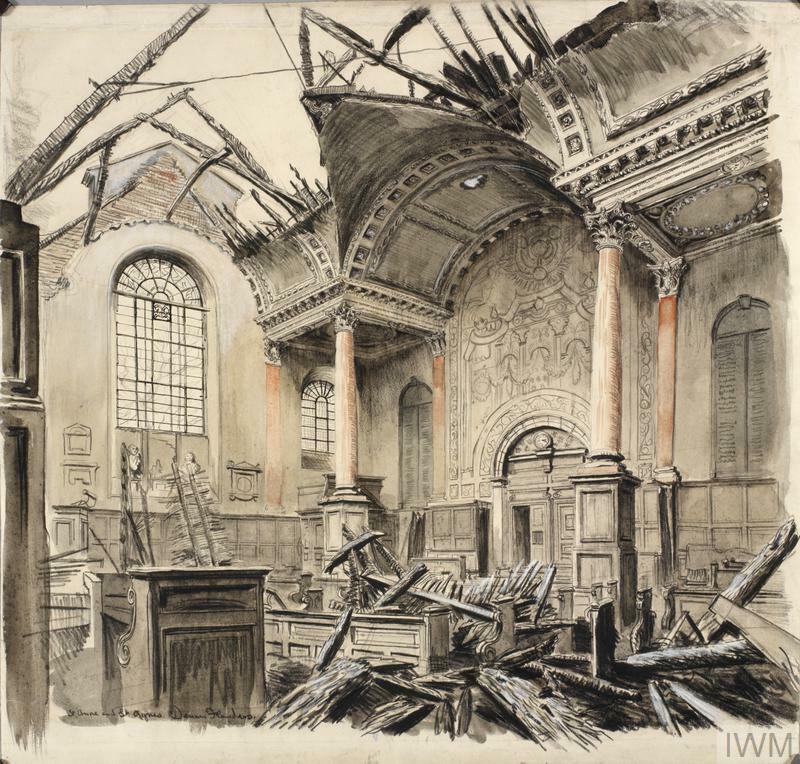 When i was researching my post of a couple of week’s ago on the Temple church, I found some paintings of the damaged church in the Imperial War Museum online archive. I was aware of the work of a number of war artists, but what I did not know about was the organisation that these paintings referenced, and that was the driving force behind the breadth and depth of artistic records from the Second World War. 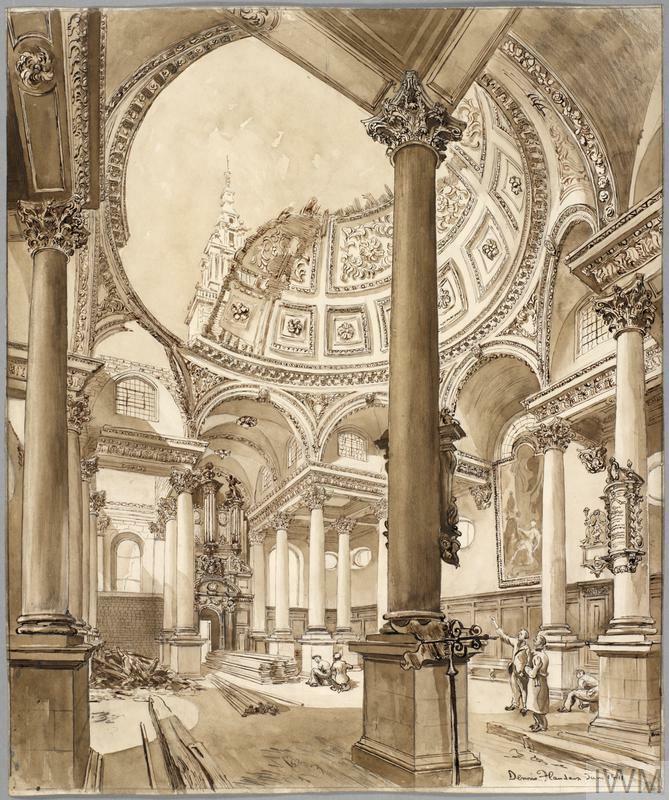 The War Artists Advisory Committee was part of the Ministry of Information and the creation of Sir Kenneth Clark who was already involved with a considerable number of artistic enterprises, including the organisation that would later become the Arts Council. Clark’s plan was that a pictorial record of the war would be produced and as many artists as possible would contribute to the project which would help in keeping artists in employment during the war years. A secondary aim was that by employing a large number of artists, it would save many artists from the fate that befell a generation of artists in the First World War. 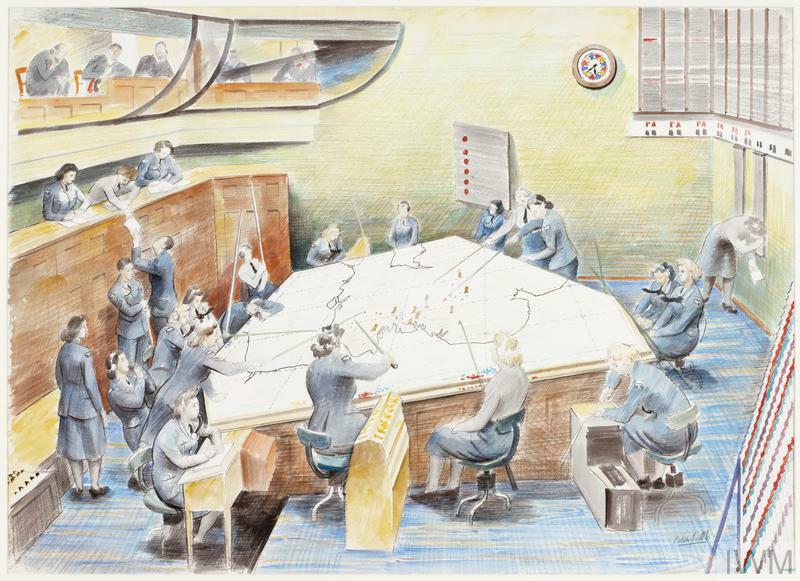 The Ministry of Information supported the creation of the War Artists Advisory Committee and the Treasury was persuaded to give financial support, however there was a challenge from the armed forces who saw the War Artists Advisory Committee as removing responsibility for war art from the control of the War Office and the Admiralty. A compromise was reached, with four artists being allocated to the War Office and one for the Admiralty, who would also pay their salaries, however the War Artists Advisory Committee would have a say in the selection and direction of their work, and full control of the work produced. The War Artists Advisory Committee (WAAC) was given a budget of £5,000 for the first year of operation, and met for the first time on the 23rd November 1939. The WAAC included representatives from all three of the Armed Services and the wartime Ministries that, due to their wartime importance, were to be covered by artists commissioned by the WAAC. Sir Kenneth Clark was the chairman of the WAAC. During the war, the WAAC employed a number of artists on a salaried basis, commissioned artists to provide works on a specific subject, and purchased the work of artists presented to the committee. Over 300 artists would be commissioned by the WAAC. 5,570 works of art would be produced (about half of these works were given to the Imperial War Museum), and the committee’s artists had a global reach, working in all theatres of war. 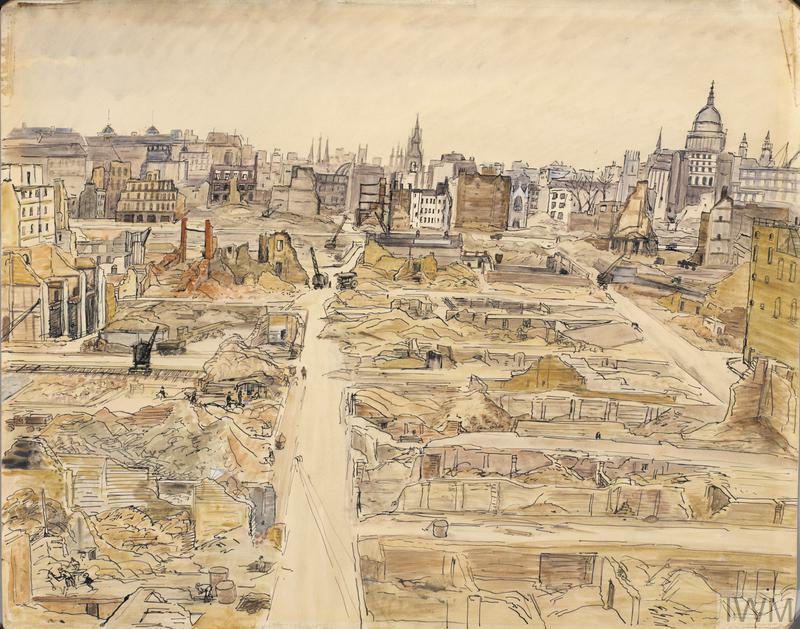 The WAAC commissioned and purchased a range of works covering the impact of the war in London and it is these works which are the theme of today’s post. 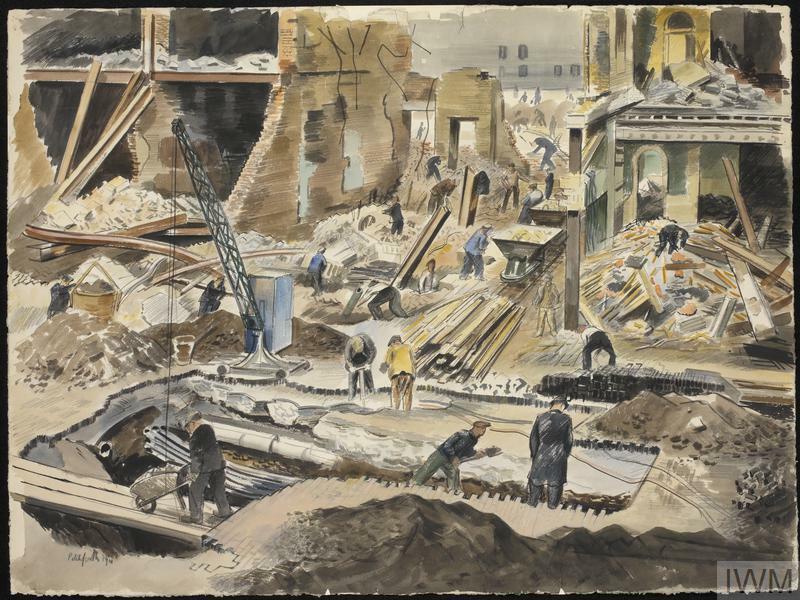 The work produced would cover a wide range of London related topics, however considering that the WAAC was part of the Ministry of Information, work was not commissioned which would show a negative view of the population’s reaction to the war. There are therefore no artistic records of looting, riots or large numbers of the population leaving stricken areas. Where there was injury or death, it was normally shown in a heroic context. I have chosen a sample of works held by the Imperial War Museum to illustrate the work commissioned by the WAAC across London. These are all © IWM and are reproduced under the IWM’s non-commercial share and reuse licence. For each picture, I have included the title, IWM reference and embedded in the title and reference a link back to the original IWM work. To research this subject, I have also used the book “The War Artists” by Meirion and Susie Harries published in 1983 by Michael Joseph in association with the Imperial War Museum and the Tate Gallery. Roland Pitchforth started work with the WAAC at the start, during the so-called phoney war. He had served in the First World War with the Wakefield Battery of the Royal Garrison Artillery. As a result of this service and the noise of the guns, Pitchforth was stone deaf which caused some problems for the WAAC when considering which commissions he should be sent on. For example, there was real concern that Pitchforth would be shot by an over enthusiastic sentry as he would not have heard any challenges or commands shouted at him. Despite being deaf, Pitchforth was able to produce a wide range of work for the WAAC, which included initial work across the UK, before being sent further afield to work on board shipping and to the Far East. Wings for Victory Week was held in 1943 to raise money for the construction of aircraft. the event ran across the whole of the country. In the above work, a Lancaster Bomber is on display in Trafalgar Square, there are flags of the allied nations in front of the National Gallery. Note the sign for the Public Shelter in the foreground. Although the next work is located in the outskirts of London, it is an iconic image showing the work of the control room in Uxbridge which had responsibility for analysing all the input from spotters and radar to track enemy aircraft and the coordination the resources needed to attack the enemy. Jewin Crescent is one of the many streets that were lost under the development of the Barbican. If you walk past the church of St. Giles Cripplegate, past the City of London School for Girls which is on the right. this brings you to an open space of grass and gardens. This was the location of Jewin Crescent. 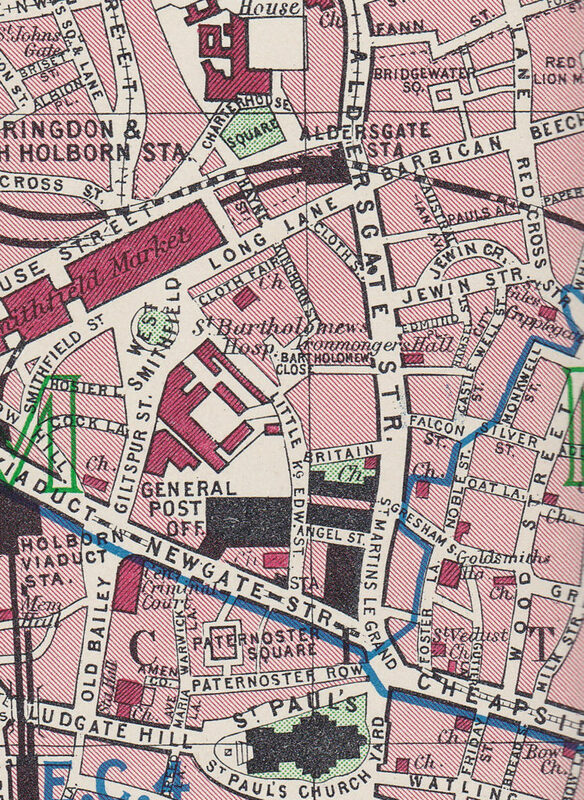 The following extract from the 1940 edition of Bartholomew’s Atlas of Greater London shows Jewin Crescent on the right hand side, just over half way up the map. The next work is titled “Post Office Buildings (Art.IWM ART LD 939)” and shows a bomb site with steel girders sticking out of the ground. 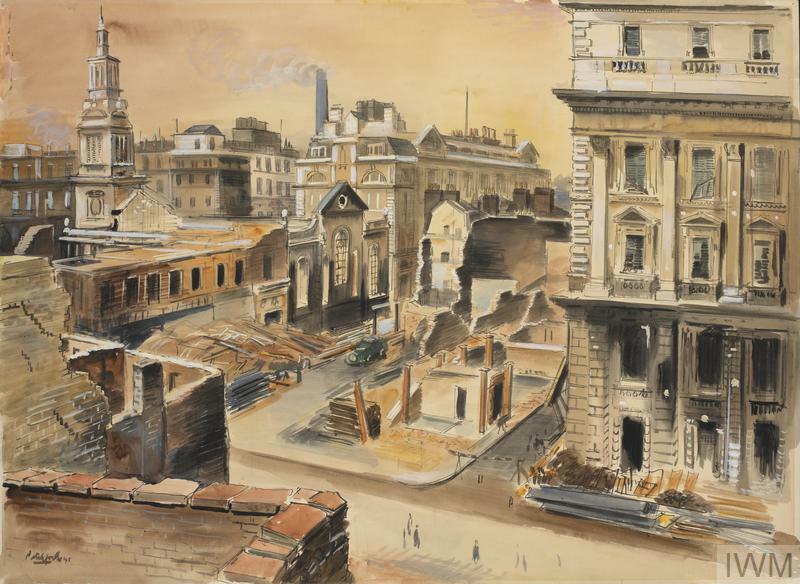 The next work, titled “Post Office Buildings : the Telephone Exchange (Art.IWM ART LD 938)” shows the church of Christchurch Greyfriars and the Post Office buildings to the right of King Edward Street. Pitchforth also produced a series of drawings showing the work of those involved in responding to the impact of bombing. 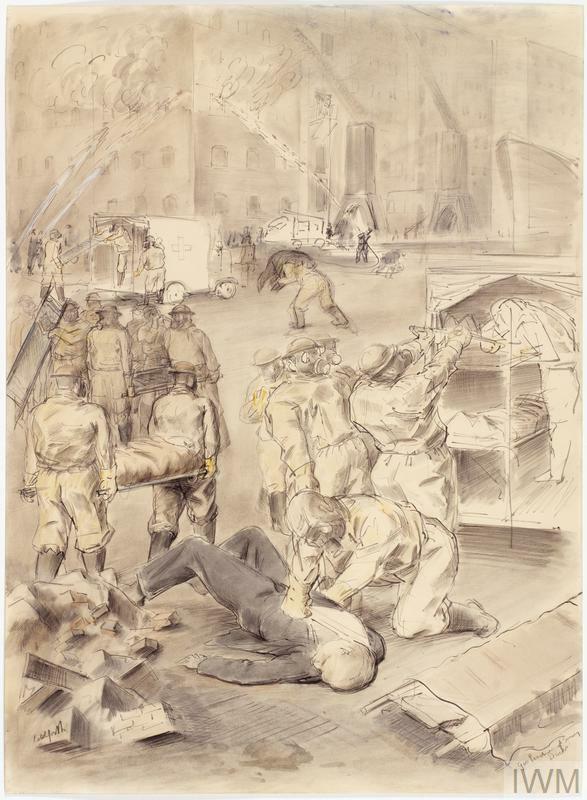 The following drawing titled “ARP Practice (Art.IWM ART LD 371)” shows ARP officers in the foreground carrying stretchers to an ambulance, whilst a civilian is being attended to on the ground. In the background, firemen are fighting a fire in the 3rd floor of the buildings. The view is of the Auxiliary Fire Service practising on the side of the Serpentine. A large pump is pushing water through the hoses and I suspect the training is focused on how to keep hold and direct a flow of water under such large pressure. Roland Vivian Pitchforth was employed throughout the war by the WAAC. Rather than taking up individual paid commissions, Pitchfork was a salaried employee which provided him with permanent employment and also helps account for the large number of works he completed for the WAAC. Before the war, Anthony Gross had spent almost 20 years as an artist in France. After his return to England, and at the start of the war he was taken on under the WAAC and soon became a salaried War Office Artist. He spent the first couple of years drawing and painting army life before embarking on a lengthy tour throughout the Middle East. The year is 1940 and the scene is of a couple of roof spotters looking out across London. Their role was to watch for, locate and report enemy aircraft and the impact of bombs across the city. In the foreground is a mapping table and St. Paul’s Cathedral and Tower Bridge can be seen in their field of view. His travel as a war artist in the Middle East was extensive. Starting in Egypt, he then worked through Palestine, Lebanon, Syria, Iraq and Iran. He was described by other war artists as being exceptionally good company and his travel diaries record a succession of “piss ups” and “beanfeasts”. Henry Moore was already an established artist and art teacher at the start of the war. He had served in the First World War and been injured during a gas attack. Whilst not formally employed by the WAAC, a number of his works were purchased and he was commissioned for a number of specific projects. 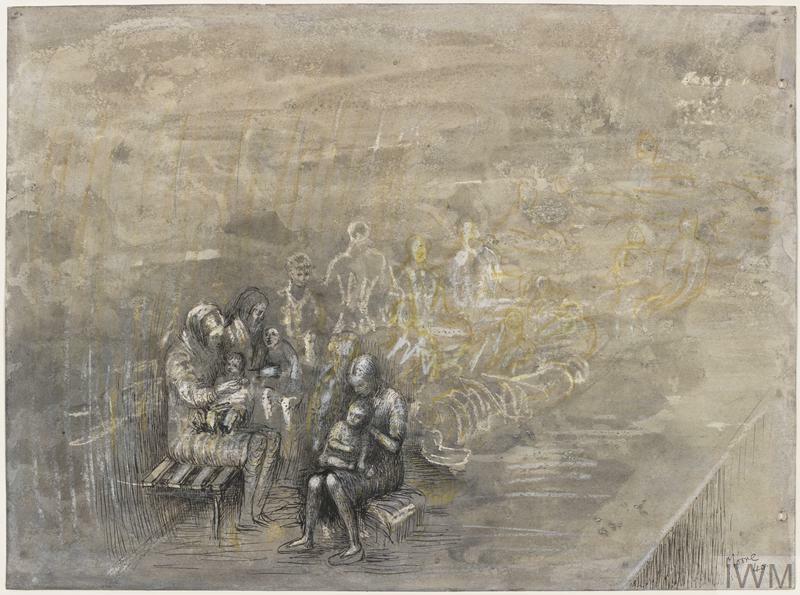 The women and children in the front of the picture are clearly drawn, however the figures become more ghost like as the view moves to the right. Henry Moore was directly impacted by London bombing. His Hampstead house and studio was badly damaged by a bomb, so much so that he had to move out and relocated to a hamlet in Hertfordshire which would be his home for the rest of his life. Edmond Kapp also fought in the First World War. During the conflict he was gassed after which he withdrew from front line fighting and worked in an intelligence role. 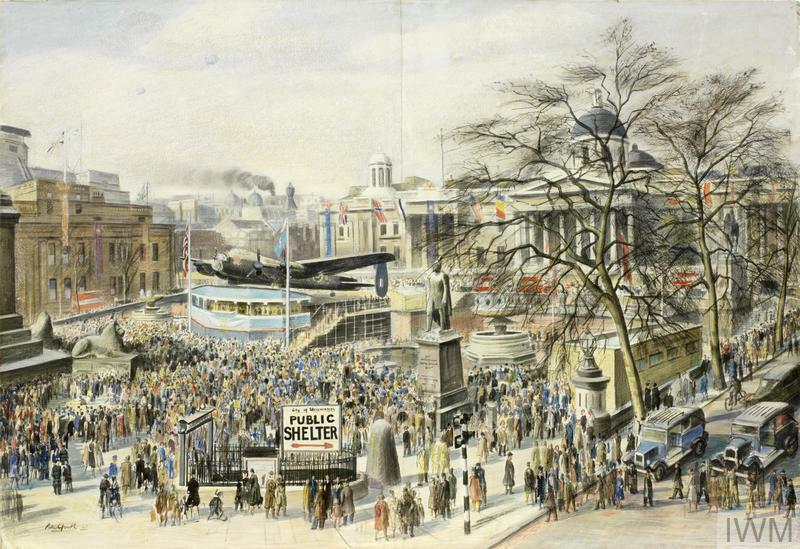 During the Second World War, Kapp received a number of commissions to provide drawings of people sheltering under London during the blitz. 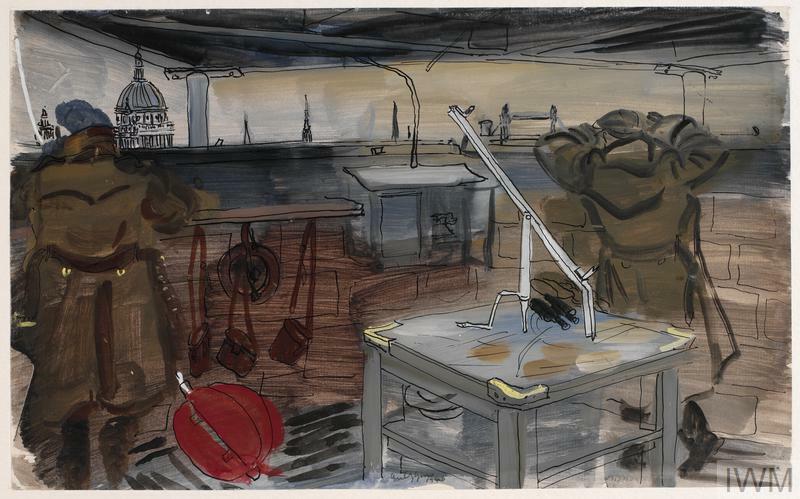 A series of drawings were made in the crypt under the church of St. Martin’s-in-the-Fields and the following drawing titled “Ready for Christmas: the Canteen under St. Martin’s-in-the-Fields (Art.IWM ART LD 800)” is an example from the series. 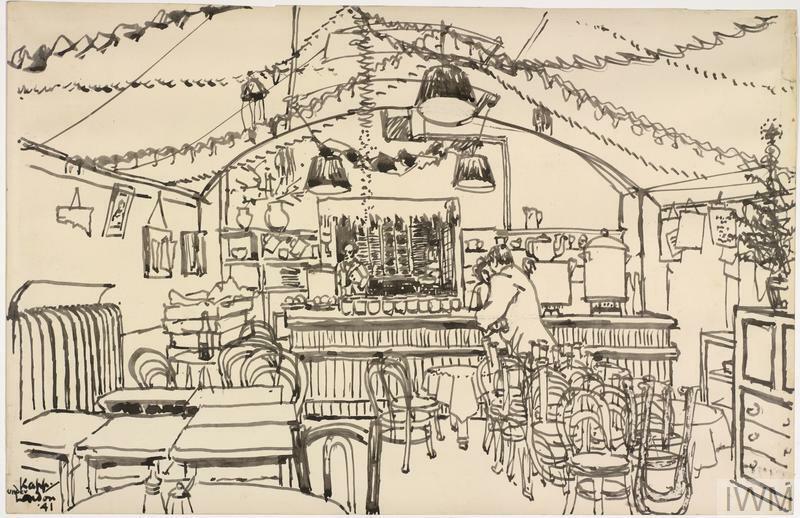 The drawing shows the canteen ready for a Christmas celebration, with a couple of figures standing at the bar. 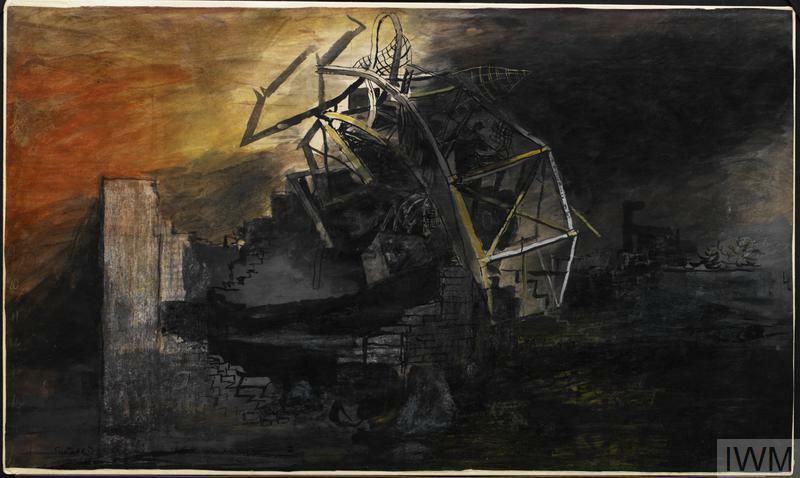 Graham Sutherland was an established pre-war artist, teaching at the Chelsea School of Art. He received his first commission from the WAAC in June 1940 and second set of commissions in August 1940. These were to produce works from around the country rather than in London. It was in January 1941 that he received a salary of £325 to cover six months of work, which ended up covering the City and East End. Sutherland’s experiences at the time reveal the response of many of the victims of London bombing, often not portrayed in stories of the “blitz spirit”. Sutherland requested a camera so he could quickly take photos of the scenes he wanted to paint. This would avoid spending time at a site drawing or painting as “it is difficult to draw in some places without rousing a sense of resentment in the people”. 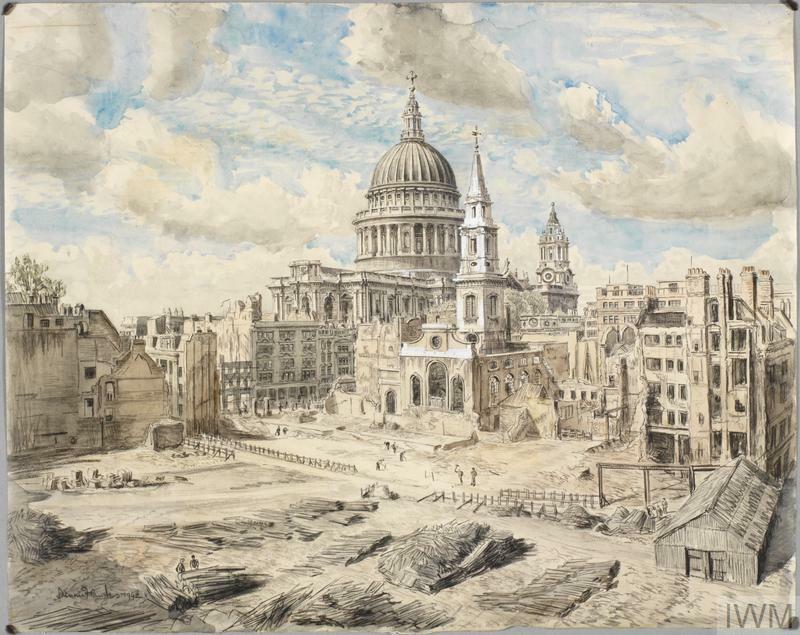 It was a common experience among many of the war artists concentrating on the impact of London bombing. Those living in the areas they wanted to paint, and had suffered the impact of bombing often complained that war artists were “cashing in” on their misfortunes. The image shows on the left an exterior view of a couple of figures looking over a bomb site, and on the right is a public telephone office with temporary booths set up in the foreground. Temporary telephone services were setup across the city where services into offices, warehouses and homes had been destroyed. Denis Flanders was an east London artist and draughtsman who used his skills during the war as part of the School of Military Engineering and later when he would create models of landscapes based on aerial reconnoissance photos. 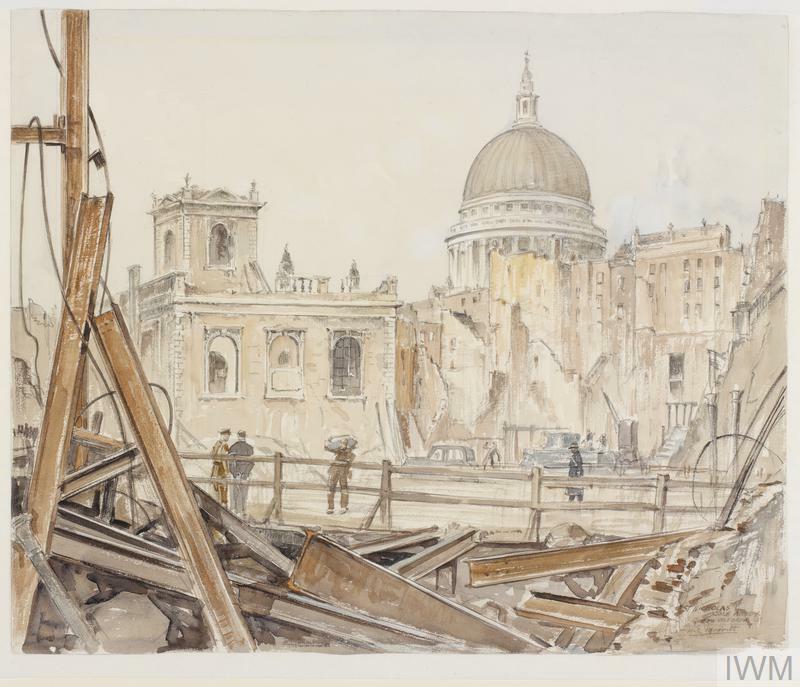 The WAAC purchased a number of his works, showing bomb damaged buildings across the country, including Exeter, Canterbury and London. These drawings are excellent, not just by showing the damage to these buildings, but also the level of architectural detail. 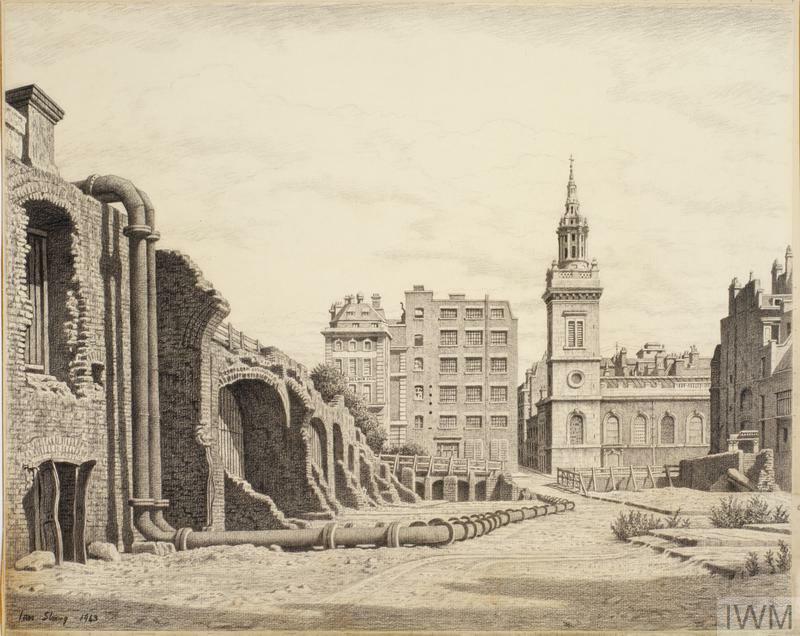 The picture shows the level of damage between Gresham Street and St. Paul’s Cathedral. The church in front of the cathedral is St. Vedast, Foster Lane. Flander’s life’s work was drawing the landscape and ancient buildings of Britain. He would cover the country by train in search of new subjects. Many of these drawings were finally published in a book “Britannia” in 1984. The subtitle to the book is “Being a Selection of the Work of Dennis Flanders Who for Half a Century has Observed, Drawn and Loved the Landscape and Architecture of the British Isles” – that’s a rather good summary for a life’s work. Leonard Rosoman was teaching life classes at the Reimann School in London in 1939. 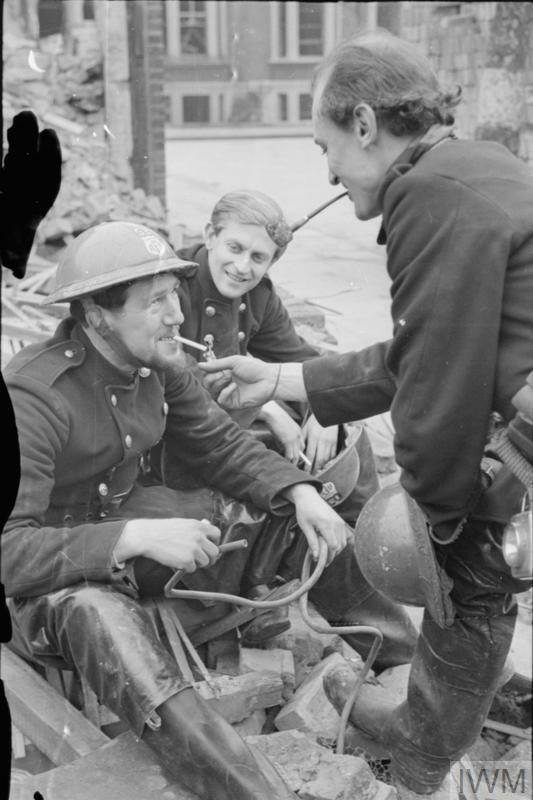 He joined the Auxiliary Fire Service during the war and his experience during the blitz provided him with the source material for a number of his works. 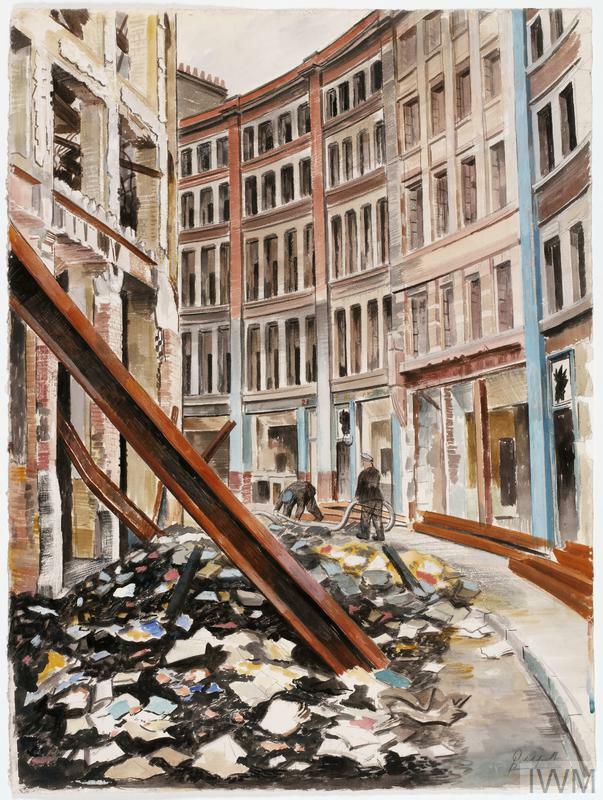 His most well known work is the following, “A House Collapsing on Two Firemen, Shoe Lane, London, EC4 (Art.IWM ART LD 1353)” The wall collapse happened in front of Rosoman and the two firemen underneath the collapsing wall are his colleagues. As an example of the challenges of accurate source data, the book “The War Artists” states that both firemen were killed whereas Rosoman’s obituary states that one of the firemen was the novelist and travel writer William Sansom (a friend of Rosoman), and the other, unnamed fireman, died in the collapse. It was this fireman that had just taken over the hose from Rosoman. The event would go on to haunt Rosoman for the rest of his life. 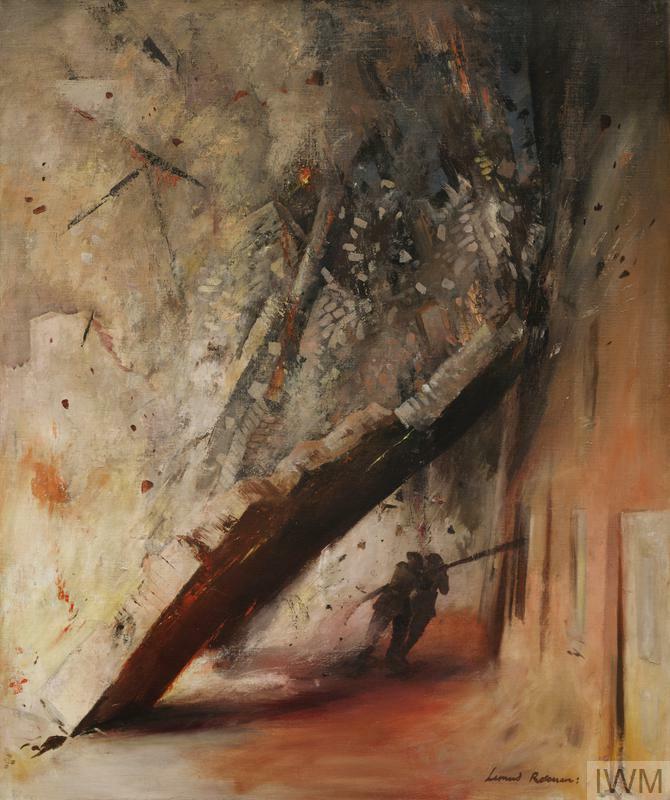 No matter which of the sources are correct, the painting depicts a scene that Rosoman experienced and graphically portrays the very real dangers faced by the firefighters on a daily basis. 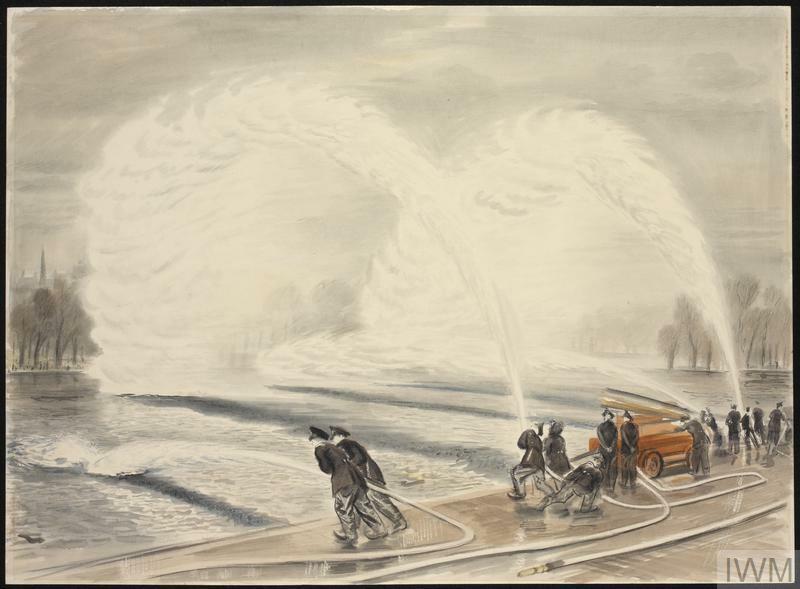 As well as his work during the blitz, Rosoman was recruited by the war office to illustrate fire fighting books. When Rosoman painted the above picture he was not employed by the WAAC. 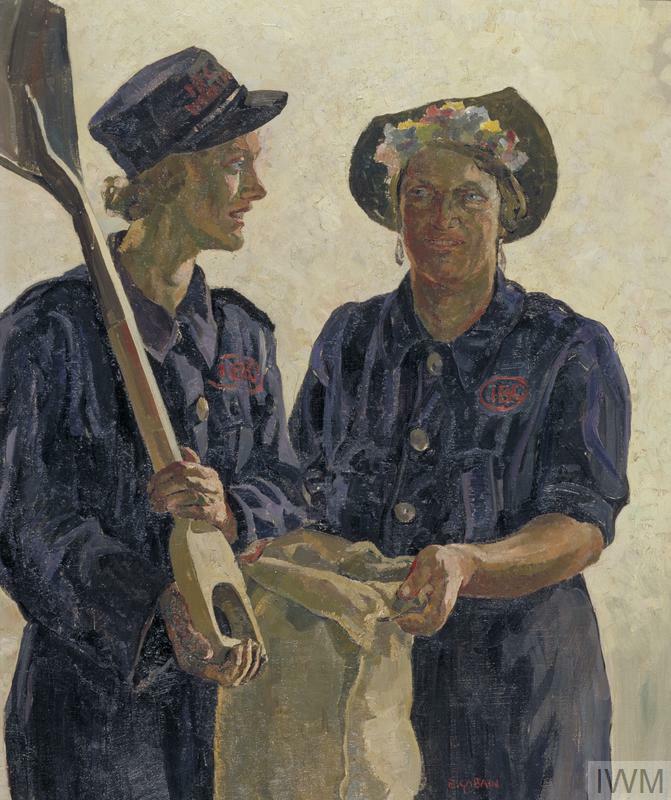 The painting was purchased by the WAAC in August 1941 following an exhibition of work by Firemen Artists and Civil Defence Artists. Later in the war he was employed by the WAAC when he would spend some considerable time with the British Pacific Fleet, painting the shipping and ships crew. The following photo (© IWM D 2617) shows Leonard Rosoman (sitting on the right) and the next artist, Bernard Hailstone (sitting on the left) on the rubble of a bomb site somewhere in London in 1940. Bernard Hailstone was also a member of the Auxiliary Fire Service and would have experienced the same death and destruction as Rosoman. The following is an example of his work and is titled “An Evening in the City : April 1941 (Art.IWM ART LD 1354)”. 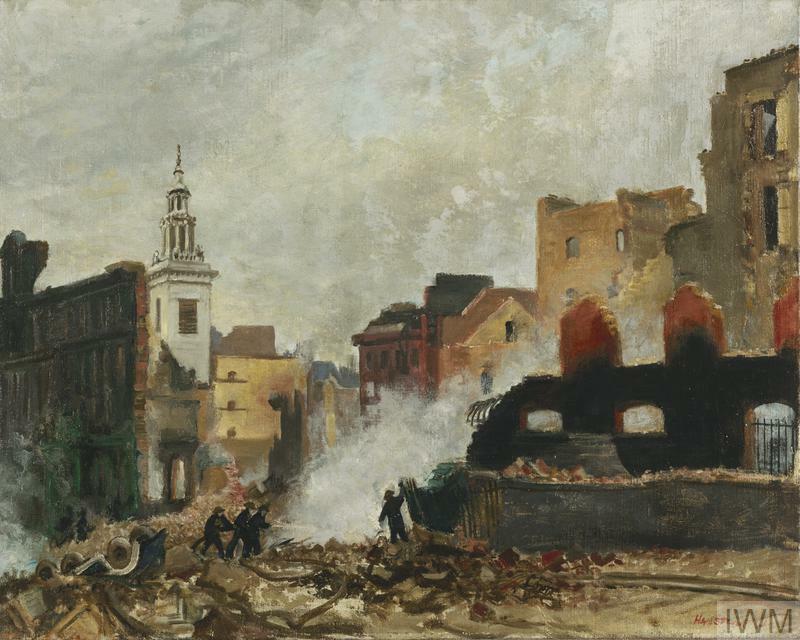 The painting shows the final damping down of a fire in the rubble of an earlier raid. The church in the background is St. James Garlickhythe. After his work in the Auxiliary Fire Service, the WAAC commissioned Hailstone to travel with elements of the Merchant Navy Service and he toured the world working on this subject until the end of the war. His post war career saw Hailstone become a very successful portrait painter. His work included subjects such as Winston Churchill and Laurence Olivier. Ernest Boye Uden was a commercial artist living in Greenwich at the outbreak of war. 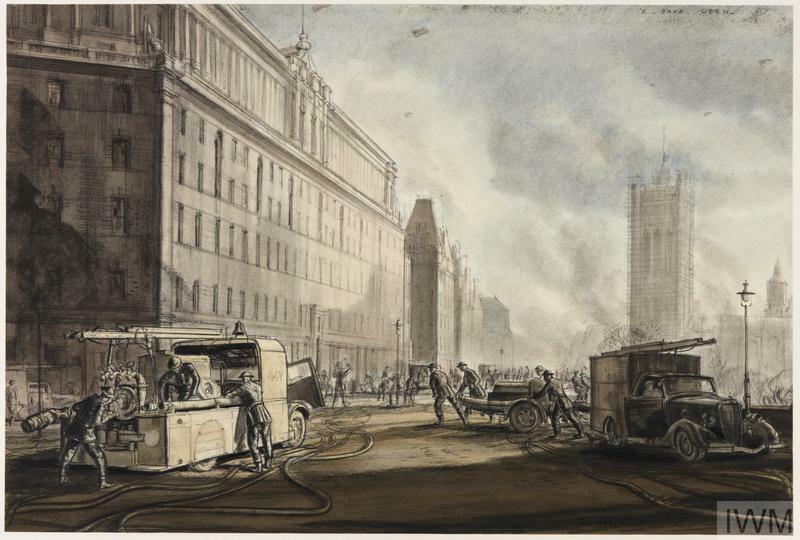 From 1941 onwards he was an artist for the National Fire Service and his work covers many scenes from across London during the blitz. 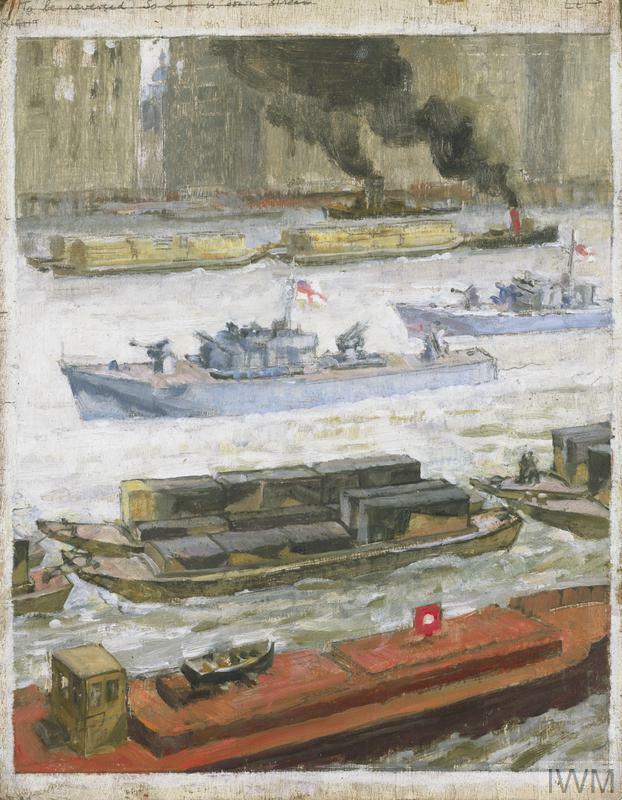 The following painting is titled “NFS Relief Crews Arriving at Millbank, London, May 1941 (Art.IWM ART LD 1359)” The location is at what is now the roundabout at the end of Lambeth Bridge, looking along Millbank to the Victoria Tower of the Palace of Westminster. After the war, Uden taught at the Reigate School of Art and continued his work as a commercial artist. 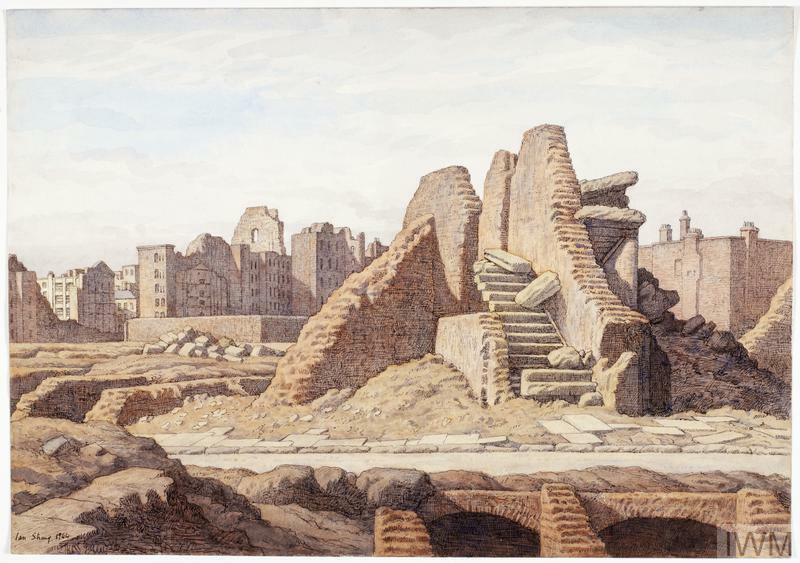 Merritt was commissioned to record the ruins of London after bombing raids. 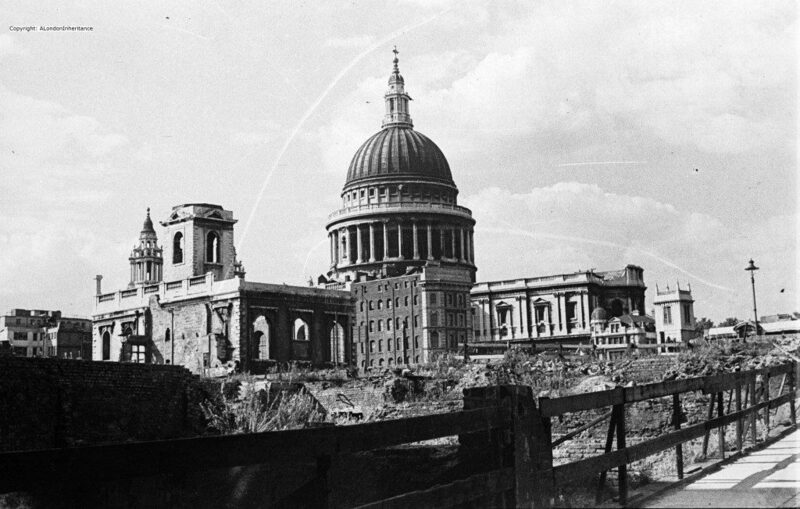 The following image shows the devastation to the south of St. Paul’s Cathedral. 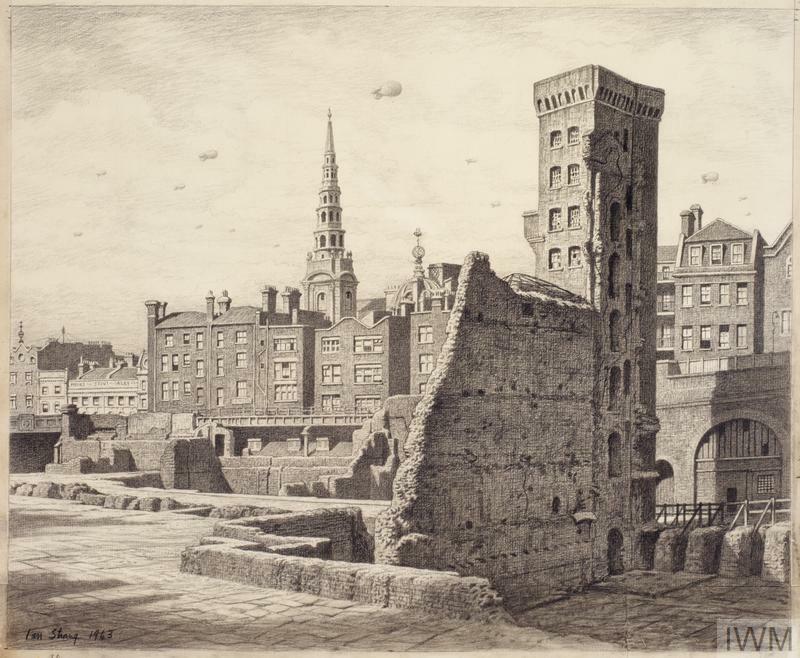 It is titled “St Nicholas Cole Abbey : Queen Victoria Street, EC4 (Art.IWM ART LD 1509)” and shows the ruins of the church of St. Nicholas Cole Abbey on the left. The illustration is very similar to a photo that my father took of the church and area to the south of the cathedral, however by the time my father has taken the following photo in 1947 the remains of the badly damaged buildings seen in front of the cathedral in Uden’s picture had been cleared (see my post on the church here). Merritt’s wartime work was very different to the country and coastal scenes that were his typical subject matter. 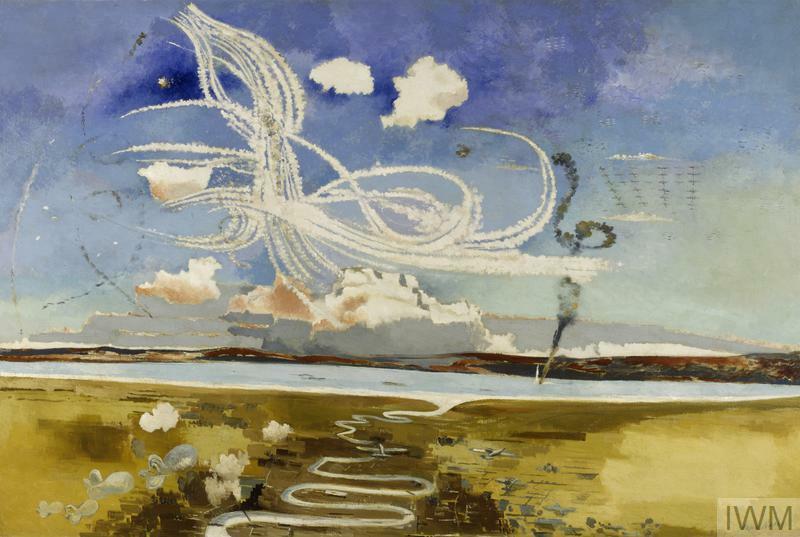 Paul Nash had been a War Artist during the First World War and had created a series of works that uniquely captured the horror of the battlefields. Although he was chronically ill with bronchial asthma he took up an artist position with the Air Ministry at the start of the Second World War (the Air Ministry wanted to run their own separate scheme outside the WAAC), however Nash was later recruited as a salaried artist into the WAAC. Although not strictly a London scene, the viewpoint is from above London with the River Thames winding towards the estuary and the sea. Barrage balloons protecting the city can be seen at lower left and the trails of dogs fights run across the sky. To the upper right a formation of planes can be seen, possibly a formation of bombers making their way to the city. There is also the trail of dark smoke coming from a stricken plane as it crashes into the water. 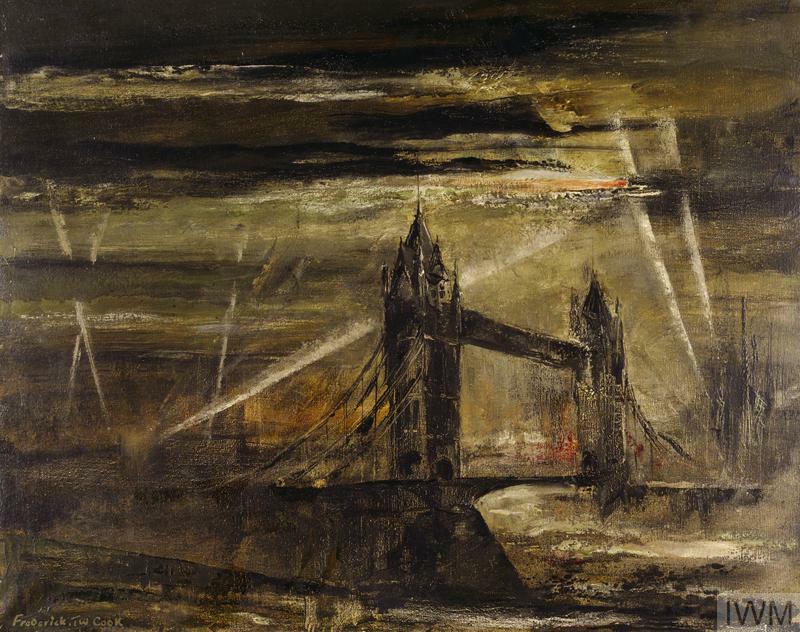 The painting captures so much about the Battle of Britain and the raids on the city. Nash would die soon after the war in July 1946, however his work from both the First and Second World Wars capture the horror and scale of these conflicts. 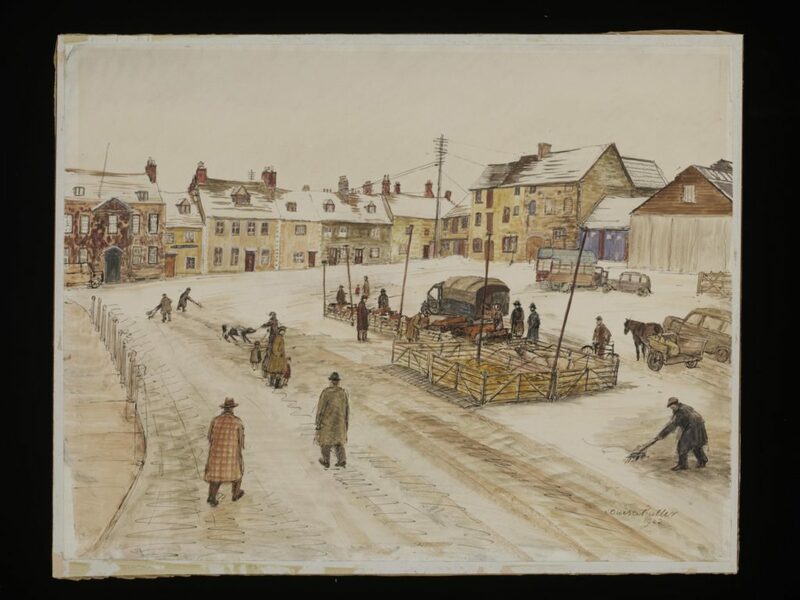 Louisa Puller was an artist who worked for the project funded by the Pilgrim Trust to Record the Changing Face of Britain, a project to record the rapidly changing countryside and urban landscapes of Britain in the 1940s. The painting is from the south of St. Paul’s and again shows the church of St. Nicholas Cole Abbey. The wooden fencing is alongside Queen Victoria Street and the remains of the cellars that were under buildings that once stood on the southern side of Queen Victoria Street are in the foreground of the picture. Henry Rushbury had been a First World War artist and was employed by the WAAC for the duration of the Second World War. He was known for his ability to record busy scenes and the majority of his work appears to have been munitions factories and shipbuilding. 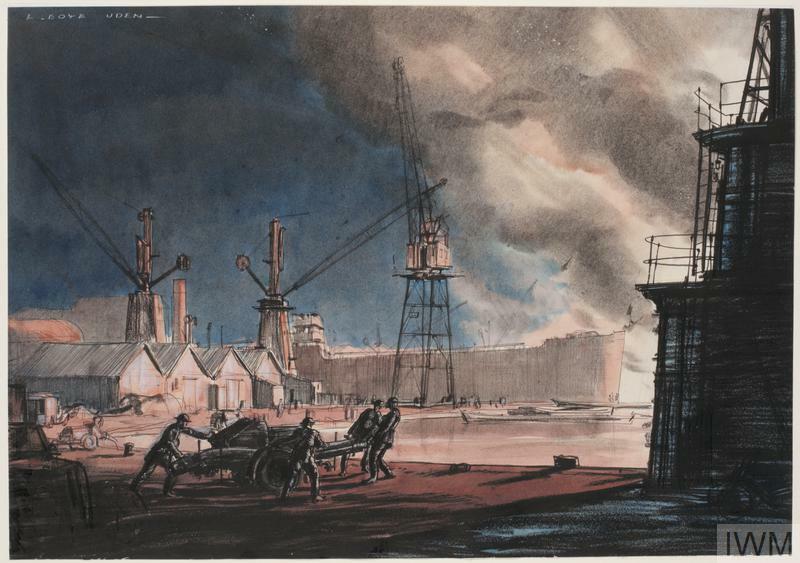 As an example of how the WAAC worked, Rushbury was commissioned by the WAAC for 100 guineas to complete three large drawings of shipbuilding on the Clyde. 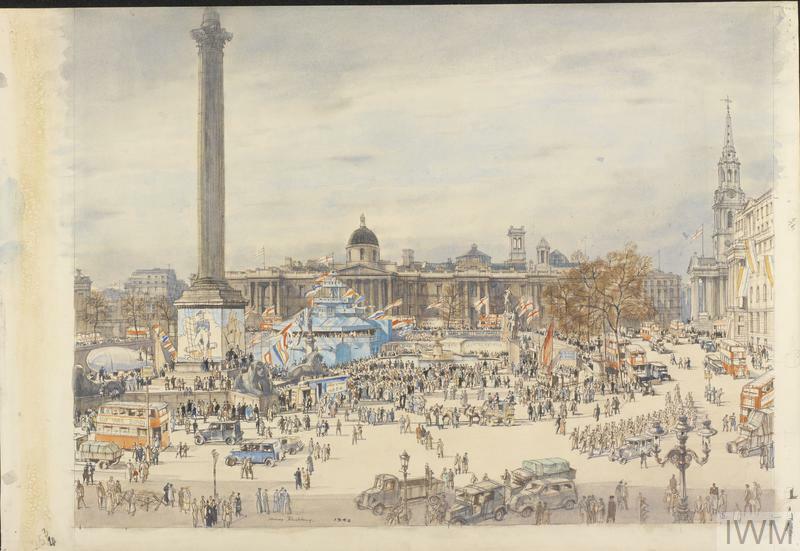 The scene shows Trafalgar Square decorated with flags, including naval signal flags with a mock-up of part of a war ship in the centre of the square. Warship Week was an event organised by Narional Savings to raise money to fund the build of warships and associated naval craft. John Edgar Platt was an art teacher before the war, and worked on a number of commercial projects which included the design of posters for the London Underground. 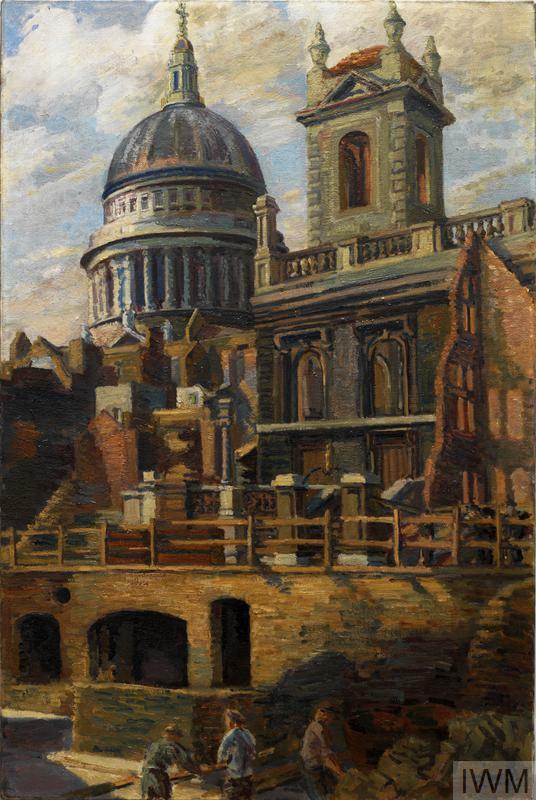 During the early years of the Second World War, a number of his works were purchased by the WAAC and in 1943 he received a contract to produce paintings of river and coastal based transport. This commission was only made possible when a representative from the Ministry of War Transport joined the WAAC in 1943 and persuaded the Treasury to provide the funding for two artists to work on transport based subjects. Note the dome of St. Paul’s Cathedral which is just visible in the gap between the buildings on the far side of the river. The street edge in the foreground has the standard wooden fencing used across the City to fence of the street from the remains of building basements and cellars. In the background a couple of barrage balloons can be seen in the sky. His work for the WAAC were his last main commissions as he died soon after in 1946. Ian Strang’s work consisted mainly of drawings and etchings as he was an accomplished draughtsman. He had served in the First World War and produced a number of works during this period. The view is looking across ruins of bombed building towards the spire of St. Bride’s Church. In common with other wartime works, barrage balloons can be seen in the sky. A railway viaduct runs along the left of the picture and from this descend a couple of large pipes that then run along the ground in the direction of the church. These were probably put in place to replace underground services that were damaged, or could have been pipes leading up from the river which carried water to a number of temporary reservoirs put in place across the City to provide emergency suppliers of water for fire fighting. The steps, now without a destination, are all that remain of the building that once stood on the site. 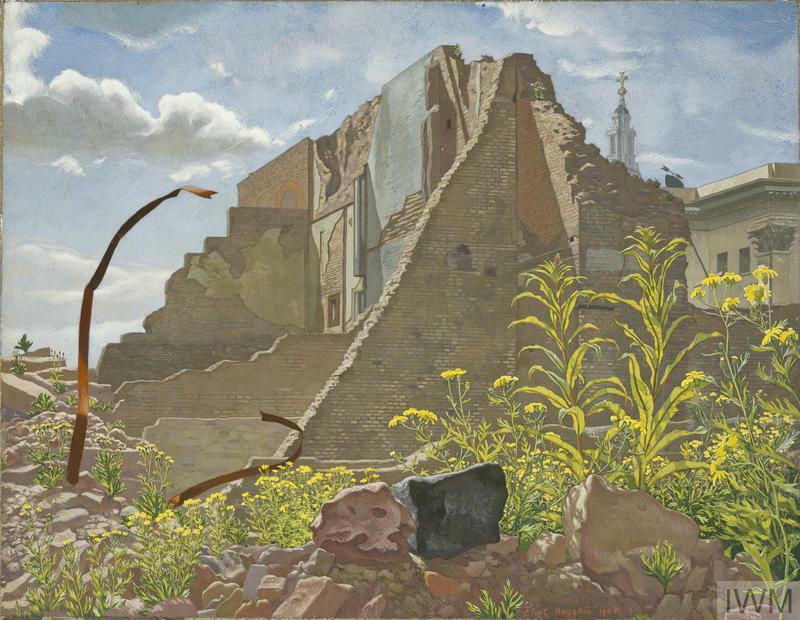 Eliot Hodgkin worked for the Ministry of Information during the war, and although he do not work directly for the WAAC, he was making paintings of bomb sites, mainly focusing on the plants that were colonising these sites in the later years of the war. He was offered a commission in 1945 and delivered two paintings to the WAAC, one of which was accepted so this is Hodgkin’s only work within the scope of the WAAC. Although it is basically a view of another bomb site, the difference is the focus on the plants growing in the foreground. 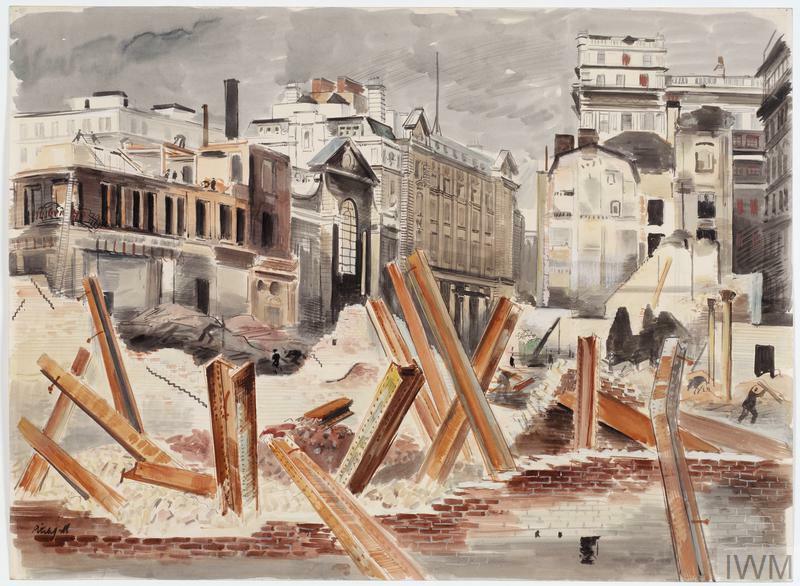 The work is titled “The Haberdashers’ Hall, 8th May 1945 (Art.IWM ART LD 5311)” and shows the ruins of the Haberdashers Hall with examples of the plants that had swiftly colonised the City bomb sites in the foreground. Ethel Gabain was a French / British artist who spent much of her life in Hampstead. Gabain was one of the first artists commissioned by the WAAC in early 1940 and she worked across the country, mainly focusing on detailed portraits of people. The final work by the WAAC in today’s post is the following by Gabain. One her commissions by the WAAC was a series of five lithographs on the theme of Children in Wartime. 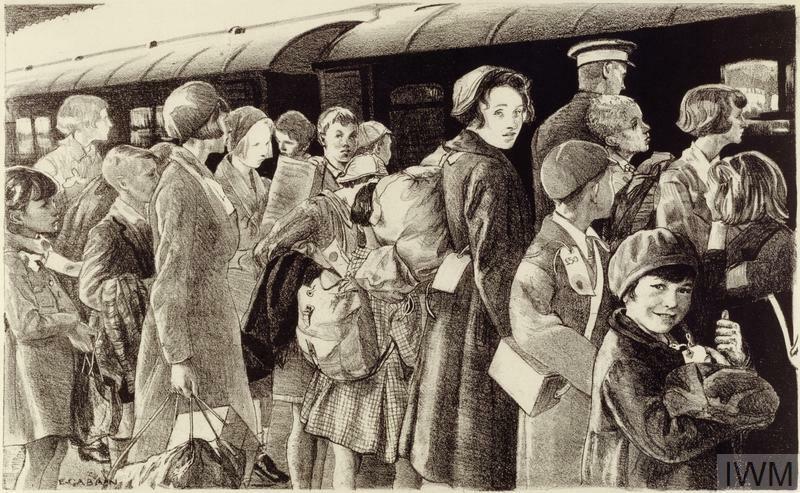 Although in Southend rather than London, this scene of children being evacuated by train would have been a common site in London – my father was one of those evacuated at the start of the war, but he quickly returned after only a few weeks away. Gabain produced a significant number of works for the WAAC during the war years, with a total of 38 being purchased. This level of output was completed despite poor health, and having to travel the country in search of her subjects. The War Artists Advisory Committee managed to last through the war, despite financial challenges from the Treasury and continued competition from the Armed Forces who believed they should own the responsibility for the art produced by their own part of the forces. The War Artists Advisory Committee continued to the end of 1945, however with the end of the Ministry of Information, there was no home for the WAAC and the committee was dissolved after 197 meetings. Administration of the collection produced for the WAAC passed to the Imperial War Museum. The War Artists Advisory Committee was responsible for producing a considerable body of work, documenting nearly all aspects of the war. I hope that this sample of works covering London has illustrated the work of the WAAC and the considerable talents of the artists working for the committee. This entry was posted in London Vistas and tagged London War Art, WAAC, War Artists, War Artists Advisory Committee on January 21, 2018 by admin. Thanks very much for an interesting article. Beautifully researched and written. And you have answered a question that I have pondered since 1977 when I came up to London to be a student nurse at Barts: what was in that big hole opposite Greyfriars church? At the time it was the City Dig and I had no idea they were exploring a large bomb site. Now it is covered by a large building that went up in the 80s. So now I know: it was the telephone exchange. Many thanks. And I agree; the more you look, the more you find you didn’t know. Which is all to the good. Splendid post – no apologies needed for length! Fascinating and enlightening. Thanks for another well researched post and this art treasure trove.. Thank you so much for this – well worth the length. I began work in 1961 at the Post Office at King Edward Buildings. All around GPO HQ, buildings were down, and the only difference from pictures you include is that each bombed area was screened off by wooden fences that were above head height. The reconstruction of this area only effectively begun in the middle 60s, and for a 16 year-old, going there from the suburbs for the first time, this was a complete and quite shocking revelation. That is a very powerful post; rather than you apologising for its length, I feel that we owe you thanks for taking the time to pull together so much work in one place. I certainly remember the numerous bomb sites that were left in many British cities even through the 50’s and the 60’s, but these works of art really bring home the sheer scale of the destruction in London. The artists bring a level of emotion and connection with the scenes that you just don’t really get from photographs; a couple of years ago I saw the Henry Moore tube tunnel paintings at the Tate Britain and found them immensely moving. Thank you for a superb post. No need to apologise for the length, it is a good read with some great & interesting pieces of art. I was born in 1954, in London, and despite over 10 years London was still a landscape with bombsites. Still buildings waiting to be demolished; and ‘gaps’ waiting for new buildings. Photographs are great, but some of these paintings still have the power to shock – mixed with an admiration of the ordinary people who took on so many extraordinary roles. Thanks for drawing my attention to these works of art. Once again a very interesting and moving post. While I was reading it this morning, with Classic FM on in the background, they played a brass band version of Nimrod by Elgar. Hearing that and looking at the scenes of destruction depicted by the War Artists sent shivers down my spine. I am old enough to remember the very many bombsites-there were so many where I lived in Bermondsey. Looking at some of those pictures,I could smell again that unique mix of brick dust,rubble and the sour scent of the hundreds of weeds that rapidly covered the scars left in the aftermath of the bombing. Your posts are always excellent, but every now and then you produce something stratospheric. I didn’t know anything about the war artists until your previous posting. The work is of breathtaking quality and a historical record that is simply superb. Well done. On the subject of being diverted, that is one of the beauties of what you do. Every piece you write unearths something that can be researched further, because there are so many unexpected findings on every London street. I went to the David Bomberg exhibition at Pallant House earlier this month and found that while he was commissioned by the WAAC to paint in the war his work was often turned down. It seems both unfair and high-handed to treat him in this way. I suspect that you could write a great deal more on this most interesting topic. Meanwhile I will share your post with Rosoman’s godson with whom I am having lunch today. Thanks so much for this – mention also perhaps of war artist and Maida Vale resident, Edward Ardizonne — known more later as illustrator of Stig Of The Dump. Love his ’30s book “The Local” recording Victorian London pubs– concerned at their disappearance even back then. What an absolutely marvellous blog. Evocative, moving and a bit of a departure for this blog. Excellent and fascinating post. It was good that someone had the vision to set up the WAAC and allowed artists to document wartime life in Britain. The Shoe Lane firemen painting is particularly haunting. I have a book called Wartime Britain 1939-45 by Juliet Gardiner which I would highly recommend and which contains more information on the WAAC and examples of wartime artists’ work, including the excellent barrage balloon (female) crew paintings by Dame Laura Knight amongst others. How absolutely fantastic thank you so much. What a fascinating post, what wonderful paintings and drawings. My mother [who trained at the Slade] had a permit to paint bomb damage, but all her sketches were lost when my parents’ car was stolen. I once started a web site with some of my mother’s work, link below. 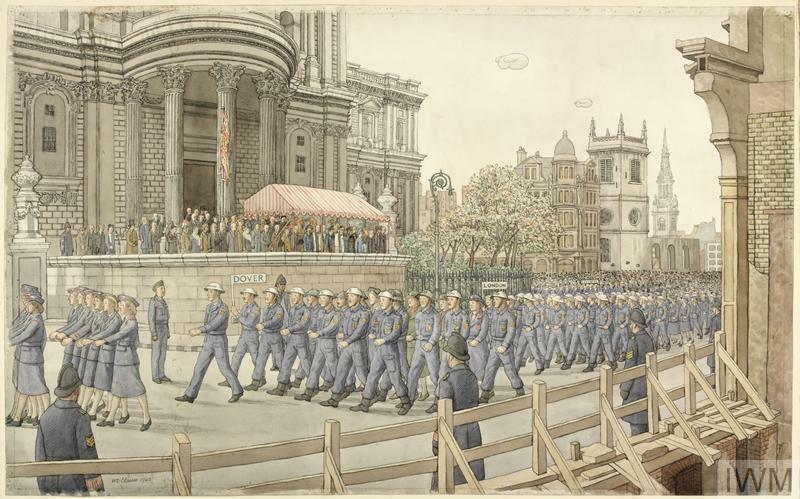 In the first illustration by Pitchforth [Wings for Victory Week] the low brick building on the right was designed as a recruiting office by her brother, N S Joseph, though he never became an architect. His father, E M Joseph, was the architect of Shell-Mex House on the Strand/Embankment. Dennis Flanders was, briefly, married to a cousin on my father’s side. She, also briefly, held the speed record for a flight from the UK to the Cape in 1931. I guess he must have known my mother’s side of the family too as I have a pen and ink by him of E M Joseph at his desk. If you missed the Bomberg exhibition at the Pallant House it is now on at the Laing Art Gallery, Newcastle, to 27 May and then at the Ben Uri Gallery and Museum from June. Regarding Leonard Rosoman, it is true that his friend the writer William Sansom survived the collapse in Shoe Lane, while the other, younger fireman who had just relieved Rosoman was killed outright. I’d encourage you to seek out William Sansom’s short story “The Wall” which was inspired by this incident, and was in a sense a coming to terms with the traumatic event, by subverting the reality of what happened. It was first published in “Horizon”, and subsequently included in “Fire and Water: An Anthology by members of the NFS” by H. S. Ingham, Lindsay Drummond, London, 1942, which was published as a literary equivalent to the successful Fireman Artists’ Exhibitions. The story is illustrated in the anthology by a sketch by Leonard Rosoman. Incidentally, William Sansom played the character of Barrett in Humphrey Jennings’ celebrated 1943 film for the Crown Film Unit, “Fires Were Started”. Thank you so much for this, I didn’t know anything about the WAAC. This would make a great subject for a museum exhibition. The area was also used in the film The Weapon. Many thanks for the excellent website, blogs and images! I have a suggestion to present some of your images, as appropriate, on interactive maps (story maps). Such an approach would lend itself particularly well to your fascinating blog about London’s war artists. I’m on your mailing list and will be happy to let you have more details via email.